Hall of the Mountain King: Review: Lyriel, "Leverage"
The first impression that Lyriel’s Leverage makes on the listener is a little deceiving. After listening to the title track, which is the first real song on the record, I thought they were a pretty good Lacuna Coil knock-off with some traditional metal leanings. Heard it before, I thought, but I’m glad I pushed forward. With the next track, “Parting,” my meh turned into something a little more interested. It opens with a djentish guitar riff, then a violin rises up over that and gets things kicked into a rollicking folk metal tune. It pulled me deeper into the record to “Voices in My Head” and its driving main riff. There’s a little bit of folk in the song, and the pre-chorus is interesting, but the key to it is that tough, thrashing riff that kicks it off and comes back after the choruses with some dark whispers and an occasional growl over it. It’s a powerful bit that’s sure to have you banging your head along. The following ballad, “The Road Not Taken,” is a stark contrast to “Voices in My Head,” just a soft guitar and a melancholy vocal from Jessica Thierjung. “White Lily” brings in some symphonic elements, but the chorus brings back the Lacuna Coil comparisons. Or maybe it’s just Thierjung’s voice, which is in some ways similar to Cristina Scabbia on a few of these choruses – but that’s not a bad thing at all. The symphonic elements come out more on “Aus der Tiefe,” and the soft, dark “Wenn die Engel Fallen,” while the folk and symphonic get blended on “Side by Side,” which brings back some of the more interesting melodies, at least on the verses. Sadly, the album closes where it began, with one of the more pedestrian numbers in “Repentance.” Thierjung has a great voice, and the band is solid, but they have a tendency, especially on the choruses, to fall back into some pretty standard goth/power metal melodies. I’d like to see them be as creative on there as they are in other parts of the songs. They should also drop the straight songs and mix in more of the folk elements. That’s where they’re at their best. Though I’m unfamiliar with the band’s earlier work, it’s my understanding that it’s much heavier on the folk metal. I may have to explore those records, because I like what I hear of it here. 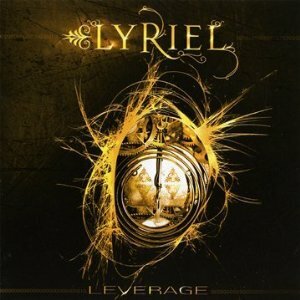 I walked away from Leverage loving a few of the songs, but with an overall sense that there’s a lot of untapped potential in Lyriel. At times, they seemed to be reining the songs in a little and pulling them back toward a more standard sound. They shouldn’t. Just cut loose with the folk stuff and let it go where it goes.